Ah, the smell of cookies baking in the oven! There’s nothing quite like it. Along with millions of others during the days leading up to Christmas, our culinary class baked batch after batch of homemade cookies. Their aroma overflowed the kitchen and into the hallways, making it a challenge to keep the safe for the school’s Holiday Party. Of course by then the cookies would have cooled, no longer the source of such an intoxicating fragrance. Rule of thumb; the desirability of a cookie is directly proportional to the strength of its smell. Later that same week the cafeteria manager presented me with an over abundance of fresh basil. He had ordered only one bunch but was delivered six. Snipped basil is notoriously perishable and, this being the last week of school, presented us with a predicament; what do you do when God hands you too much fresh basil? Why, you make pesto, that’s what. Some parmesan cheese, a few cloves of garlic, a dash of sea salt along with a couple handfuls of walnuts (pine nuts were not handy) all tossed into the Robot Coupe with our basil then blended with good olive oil and Presto! – Pesto. Removing the food processor’s lid I was suddenly struck with the over powering pungency of green. The pesto smelled so green, so grass-like that it immediately conjured up images of summertime – a freshly mown lawn, my hammock swinging in a warm yellow shaft of sunshine, softly singing birds drinking at the bubbling back yard fountain. Unless we have a condition known as synesthesia we are bound to be frustrated as well when we try to ‘smell the color nine’. But I think Rice might be looking too closely at the problem, trying to put his senses to ‘logical’ use in order to encounter the sacred. While it may be difficult to invision God intellectually we may actually open more of ourselves up to him when using our senses synergistically. Not long ago I found myself sittin in a dark wooden pew beneath towering white stone arches. In front of me a shining marble altar climbed up towards a large burnished crucifix that was hanging from the ceiling. This was the century old chapel sanctuary of St. Mark’s Catholic Church outside of Baltimore and I was attending the funeral Mass for my Uncle Jim. 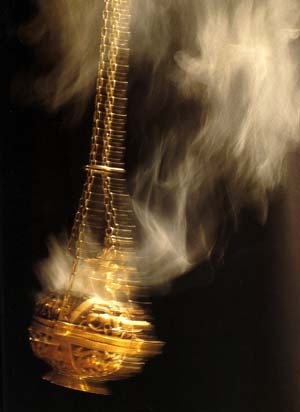 After Holy Communion was shared the priest began to gently wave the brass thurible by its chain, the burning incense inside tossing wreaths of smoke around my uncle’s casket. The smoke writhed slowly heavenward, flickering through narrow shafts of colorfully stained sunlight. Breathing in deeply, the scent of burning pitch pine instantaneously transported me over 30 years back to when I was an altar boy. Quickly, a series of brief snapshots of my days as a Catholic youth replayed in my mind; the times I spent on the altar during Mass, wearing a black cassock and white surplice, nervously ringing the hand-held Sanctus bells. Kneeling with hands clasped tightly, in the pews with friends and family (including my uncle), taking the Communion host on quivering, outstretched tongue. Pictures that I had not seen in decades, dark and dusty, suddenly brushed off and brightened by the merest whiff of this sacred odour. Again I was reminded of what the Catholic church does so well. They understand that we encounter God in many more ways than just our intellect. Joyful sensations are not solely reserved for the sense of hearing as when we sing hymns, recite prayers or listen to sermons. God’s presence abounds through the sounds of small bells and rustling fabrics, bright colors, gleaming sunlight, guttering candles, deep and heavy drapes against hard marble, boisterous song, the soft and familiar intonations of common prayer as well as the aroma of ancient incense. As a younger, more arrogant man, I wrote off these deeply ingrained practices as the lingering primitive habits of a superstitious and overly ritualistic people. I now see the beauty of these sacred traditions. They point to God as they proclaim the reality of the supernatural among us, the familiar rituals helping to bridge the divide between our meager comprehension and what lies beyond. An atmosphere of the sacred permeates these places. Using all of our senses, often unconsciously, we encounter the tangible presence of God in much the same way that the atmosphere of a fine restaurant enhances the experience of the diner. One need not focus too closely on the mechanics of the environment to enjoy all those sensations that go into creating an atmosphere of sensual and spiritual delight. This entry was posted on December 27, 2007, 3:44 pm and is filed under Art, Christianity, Church, Culinary Arts, Culture, Faith, Food, God, Metaphysics, Religion, Spirituality, Supernatural. You can follow any responses to this entry through RSS 2.0. You can leave a response, or trackback from your own site. Don’t you ever call your wife that again! No, didn’t you catch that? He called you siluette. That’s awful. Back in de old days I almost got throwed in de pokey, mon.